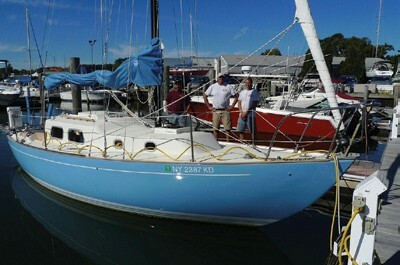 John Bischoff purchased his 1976 Whitby Alberg 30 on the East End of Long Island and took a slip at Brewer Yacht Yard at Greenport for the summer of 2013. We got to know John and his boat while watching him sail in the evenings with his crew, always with a smile on his face. We talked often about deck repairs and hull paintwork but never finalized a plan, because in truth the project seemed a bit overwhelming in its scope. We needed to ease John into the amount of work the restoration entailed. Several cracks needed to be repaired prior to fairing the hull. John bit the bullet and gave us a go-ahead last winter and the boat was stored inside and the work began. First, Walter Tramposch and Paul Kreiling cleaned the boat out and removed every piece of deck hardware. Then Walter, Joe Martocchia and Jimmy Woodhall began the task of removing and cleaning up the old deck and chainplate repairs to get the boat back to original condition. After sanding the house and deck, all of the deck delamination and rotten core areas were opened up. Rotten balsa core was removed and replaced with closed cell core material, followed by new fiberglass work. All crazing and cracks were ground out and filled/faired using vinylester fairing. The entire deck, cockpit and house were sprayed with high-build Duratec, which was block sanded to fair all surfaces. The first stage of the Alberg 30 restoration was the deck, shown here after the first coat of primer. The house, cockpit, waterways and decks were sprayed with ALEXSEAL® topcoat. Non-skid patterns were laid out and completed using ALEXSEAL® products. The hatches/garage and companionway surfaces received new wood treatment. The windows were replaced with newly powder coated trim rings and laminated glass. All hardware was replaced with new stainless steel fittings. The lifeline stanchions were restored, gate braces were added, and new lifelines were installed. The installation of new Lewmar self-tailing winches completed the work on deck. With the deck complete, John gave us the go-ahead to take care of the topsides. 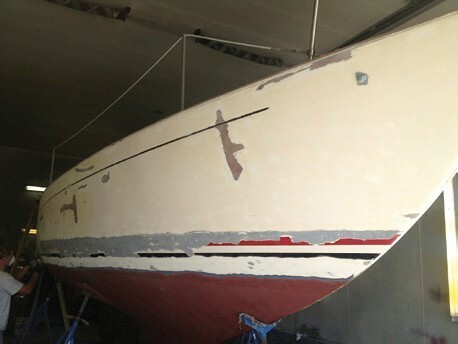 Joe Martocchia and Eric Scharph began by stripping the old hull paint down to bare fiberglass. 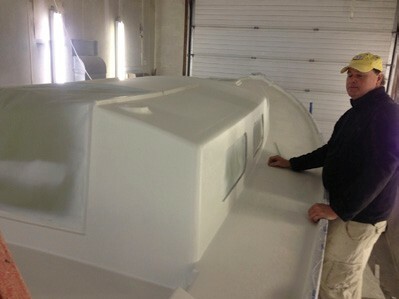 The hull was than faired with ALEXSEAL® fairing compound and board sanded to fair. Spray ALEXSEAL® fairing was applied, followed by more board sanding and high build primer. When faired, finish primer and a blue topcoat were applied with double boot and cove stripes, followed by a clear coat. She’s a beauty! Brewer craftsmen Joe Martocchia, Walter Tramposch and Eric Scharph, proud of their work. After launching, new shift controls were installed, the engine was tuned up, and new Raymarine electronics were installed. New sails and sail covers, new cushions, a new flag staff, a custom swim ladder and final deck details completed the project. John and Nicholas are now happily sailing Jaunty around the Greenport area, and will be racing in the Brewer Time Warp Regatta. The entire job was time consuming and skill intensive, and not inexpensive. John’s love for the boat and desire to have a truly shipshape vessel made the project worthwhile. 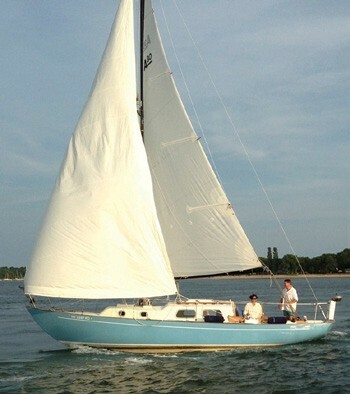 He receives compliments wherever he sails and takes pride in having a truly one-of-a-kind classic sailboat. The Brewer staff is proud of their work and willing to show the boat to any interested visitors. It was a pleasure to work with John on this project and test our skills and techniques to their fullest. Nicholas and John enjoy a sail off Greenport. Mike Acebo is the General Manager of Brewer Yacht Yard at Greenport in Greenport, NY. He enjoys his job because each day brings something new. In his spare time he enjoys building, sailing and racing iceboats.